Stinson Beach is only 90 minutes from Oakland, across the San Francisco Bay, San Francisco in the mist to the south and the hint of San Pablo Bay to the north. Through Mill Valley and up an easy mountain road 1,600 feet on the shoulder of Mount Tamalpias, then down through pine and then oak forest. Rounding a curve and breaking free of the trees, the 3-mile curve of Stinson Beach emerges, backed by a vast saltwater lagoon and ending in the Bolinas headland and the 110-square mile Point Reyes National Seashore beyond. Regardless of the season the sky can be filled brilliant sun with the barren rock of the Farallon Islands clearly visible 25 miles off-shore or the end of the beach and lagoon only hinted at through the fog. I’m sitting looking out on the sunny beach, sitters, runners, walkers, ball players, surfers and the happiest dogs on the planet; what you would expect from a California beach. But it’s cool, and breezy. Waders, no swimmers, the water’s in the mid 50’s, even the bravest only dash in and then quickly out. Other days it can be overcast and foggy, windy and cold. Stinson is a walkers’ beach. Check in advance for weather and tide. The best walking is a couple of hours either side of low tide when you are greeted by a broad expanse of flat hard sand. Don’t let the cold or fog or even rain deter you, they can be the best days. Come well equipped, dress in layers. You may only stay couple of hours but it’s well worth the trip. A few days ago, after our 6am walk to catch the low tide, our coats were fog soaked. I saw something I had not noticed in all those 30 years. Most times the beach covered by tracks in the sand, people, dogs, sandcastles, big and little holes, driftwood, shells and rocks. Today was different, I was almost the first person on the early morning beach, hardly any tracks at all. I came across almost unnoticeable faint curlicue tracks in the sand. I followed one which started in a hole in the sand and ended in a 1” long sand crab rolled over in its back feet wiggling in the air. Where were they going? What turned them all over on their backs? Was this a strange suicide dance? Would the rising tide save them or would they die as the sun rose? Not so long afterward, walking back the beach was the usual array of tracks but those faint crab tracks were still there. They have always been there, unnoticed. 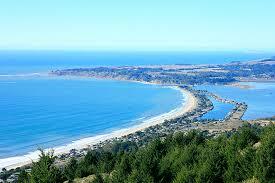 I’ve walked Stinson Beach for over 30 years and spent almost every Christmas Day here. In 1996 I made the miscalculation of getting my 12-year old daughter a surf board for Christmas, never thinking that, of course, I would have to take her surfing Christmas morning. The memory is great and the aching brain freeze when my head went in the water has mostly, but not completely faded. When you come for just the day, by sunset you’re often gone, or if you wait until the sun dips below the horizon, you smile, even cheer, and then head home, missing the final gasp of light into pure darkness as the stars, one by one appear. This is for those who can stay the night. But even for those most most are tucked into their houses talking, finishing up dinner, doing jigsaw puzzles or watching television as if this display were not happening or as if it were to common to be remarkable. An almost silent jet, glides overhead, low enough to remind you that you are close to a city, not at some isolated outpost. Against the fading light of the lingering solstice sunset, the lights of a fishing boat, sheltered behind the Bolinas headlands, waiting for an early venture. Whipped up by the afternoon wind the ocean has laid down, with only a light breeze and the underlying surf, a background song churned up from some Alaskan storm. Most of the day’s footprints erased leaving only water-like rills and the paths of those few who linger. The cool dry sand soft underfoot. Another soul walks out of the dark then then gone. Why do so few choose this. There should be crowds, or at least hushed knots of viewers, perhaps huddled around small fires against the chill. vendors selling hot chocolate. There’s a race for the light to fade enough for the starlight to arise in its full display before the just past full moon rises, flooding the sky with its light and erasing the brilliance of the Milky Way. This night the full moon wins rising over the hills. Am I the only one tonight? I should grab a blanket and sleep out here keeping the vigil. But in the end, I will choose a hot shower and a warm bed, leaving this scene unseen by man this night as most nights. Showered and brushed, I venture out one last moment to absorb the night leaving my moon-cast shadow on the wall. Then to bed with the surf sounds in my ears.